We have a number of December announcements. Full details of the Dojo 1.9.2 release are available on the mailing list. We expect to have backsupported IE11 support available for Dojo 1.8 within a few weeks. As many of you know, Intern is our replacement for DOH for Dojo 2.0. In order to make it easier for us to test and maintain multiple versions of Dojo, we are starting the process of replacing all existing DOH tests with Intern tests in the 1.x codebase. If you would like to get involved, please volunteer to assist in migrating tests. We will post additional instructions shortly on how to get involved. SitePen is running a December promotion with a free Dojo 101 workshop when registering for any of their Dojo 201 or 202 workshops in 2014. They are also offering both free 101 and 201 to the first person to register for all 3 workshops in each city on their calendar. Read the full details on this Dojo workshop promotion. The full Dojo workshop schedule for 2014 is also available. The following is a guest post from Christopher Folger, creator of a Dojo plugin for the JetBrains IDE. Thanks Christopher for sharing information about your plugin. Needs More Dojo is a plugin that provides awareness of Dojo’s AMD system and object model to the IDE. Its main purpose is to simplify the management of the imported modules array (and corresponding function parameters) in a define block. For example, instead of typing “dijit/layout/ContentPane” and adding a “ContentPane” parameter, Needs More Dojo lets you type “ContentPane” then inserts the correct module path and parameter for you into the existing list of imports. As you are writing code, when you reference an AMD module, you can use a hot-key to import the module instead of adding it manually. It will also flag unused modules with a strike-through and allows you to remove all unused modules at once. 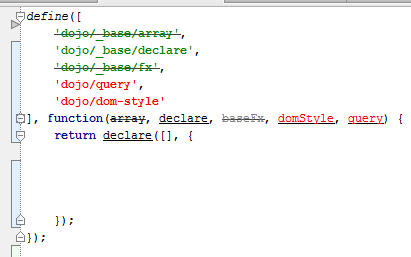 Allows navigation to attach points in modules that use _TemplatedWidget and i18n resource keys when using dojo/i18n!